A farmer could get used to days like these, but there's no room for complacency in this line of work. Overnight lows and buckets of rain are still lurking out there for Spring. We started things off with frost on the ground Monday morning, but quickly found ourselves opening up greenhouse doors, uncovering seedlings in the greenhouse and getting to work outside for the day. 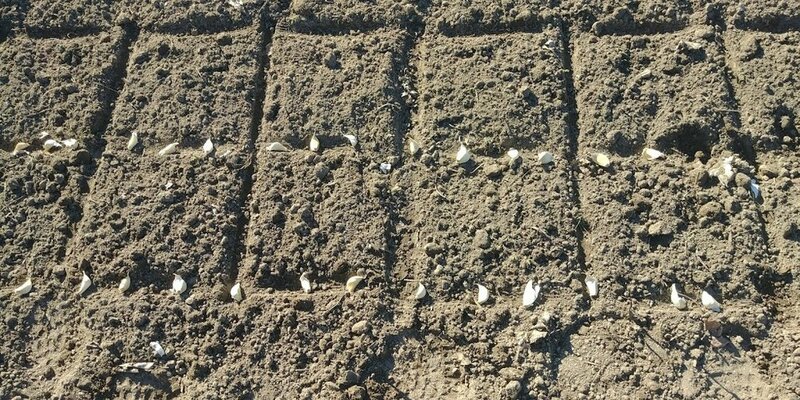 Kim has planted another round of Spring Green Garlic that we'll get to enjoy later on this season. We're still waiting to see how the February snowstorms will ultimately impact some of our treasured overwintering crops, but we should have answers very soon. The beginning weeks of our Spring Share are geared toward the enjoyment of things that have overwintered , not just as in “Winter, we’re sooooooo OVER it,” but more that we count on crops that we set in motion anywhere from 6 months to even a year ago to carry us through until we can really get into the field and get rolling. Sunny spring days like these are so deceiving--it feels like Summer, but the plants just aren't there yet. (But have I mentioned how delicious Grilled Leeks are?) So we gamble with overwintering crops to try and close the hunger gap of March. I call it a gamble, because honestly, we never know exactly what our Fall and Winter will do to something that we plant in Summer. When we win, it feels like hitting the jackpot. But, there are losses in the game. The primary crop that springs to mind is the perennially fickle Purple Sprouting Broccoli, aka the Notorious PSB. Oh, PSB--you are my weakness. I wish I could quit you, but you're just too darn tasty. Unlike the crowing broccoli we're more accustomed to, these plants grow long edible shoots and leaves meant to be eaten in their entirety, leaf, stem and all. It is a phenomenal addition to Pasta and can be used much like regular broccoli. I can't recall exactly where I read it, but someone recommended preparing PSB like one might enjoy Asparagus. Last year we had a full on crop failure, but this year's round was looking stellar. I’ve popped a few photos in for you to see the comparison. On the left you'll see how it looked just one week before the snowstorms hit. It was sprouting alarmingly early for sure in January, but it was looking lush and just about ready to pop. Aaaand if you look to the photo on the right, you'll see what the storm left us with. Ouch, right? We're not alone as far as Western Washingtonian farms go. 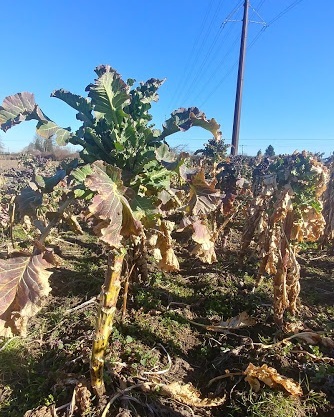 Many of our colleagues have seen their entire crop destroyed by the weight of the snow and ice or devoured by hungry birds. This goes for things like Kale and Collards too. It has been such an economic disaster for Nash's over in Sequim that they have kicked off a GoFundMe campaign to help them recover. In light of what others are seeing, we feel lucky to have not suffered a complete loss….yet. (There’s that growth mindset!) The plants are sloooowly taking their time to recoup; however, we're not sure when and in and what quantity that will happen--days, weeks, longer, never--we'll just have to see. So, just in case, I have hopped at the chance to share some Purple Sprouting Broccoli with the CSA this week from a lucky grower in Oregon whose crop actually survived. I need validation of how and why overwintering is worth the heartache. And while we await the ultimate fate of our crop, we’re going to offer you some of Nash's Sunchokes this week too. I’m going to grill those too on one of these sunny nights as we head into spring for real. For those of you who haven't tried them yet, Sunchokes are neither Artichokes nor do they hail from Jerusalem. They're actually relatives of Sunflowers, producing a tiny yellow flower in the latter part of the year. The tubers so just happen to taste a whole lot like globe artichokes. Roasting Sunchokes with Olive Oil is a great way of showcasing their nutty flavor, and they even make a great addition to a soups and salads. I happen to have a favorite Stir Fry recipe that I'm sharing below. They don't need to be peeled--just wash and go. One warning though...while just about everyone loves the flavor of a Sunchoke, a handful of people may find them difficult to digest, because they are high in inulin, a non-starchy dietary fiber. On the other hand, this is what makes Sunchokes such a great prebiotic.